A beautiful bundle of colorful stones will make a bright wreath for your neckline. 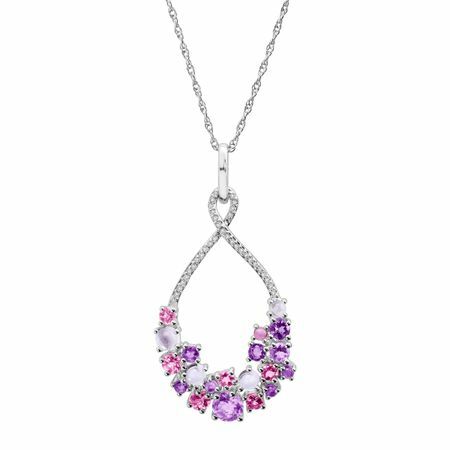 Natural pink tourmalines, light amethysts, and pink amethysts, totaling 2 ct, are illuminated by round-cut diamonds, totaling 1/10 ct, lined around a loopy sterling silver stage, sure to add extra glamour to this ultra-feminine pendant that you can wear for any occasion. Piece measures 1 5/8 by 13/16 inches. Comes with a sterling silver 18-inch rope chain with a spring ring clasp.